Who knew there were so many layers to rock bottom? In every game this series, it has appeared it couldn't get any worse for Zimbabwe, or easier for Pakistan. It seemed impossible there could be a nadir beyond what transpired in the third ODI, with Pakistan bowling Zimbabwe out for 67 and chasing it down in 9.5 overs. But the chasm grows wider by the game. On Friday, after winning the toss and deciding to bat, Pakistan began to put statisticians around the world on notice. Pakistan plundered 399 - their highest ODI total - while Fakhar Zaman made a brutally destructive 210 not out off 156 balls as Pakistan pulverised Zimbabwe by 244 runs. Along with Imam-ul-Haq, Fakhar smashed a slew of records against - it has to be said - a poor, second-string Zimbabwean side who had a terrible day. Even so, their powers of concentration, their hunger for runs, and refusal to be complacent hint at traits even the best batsmen in any generation struggle to master. Zimbabwe never appeared to have the conviction or the resources to begin an attempt at a chase, a pretty cameo from their captain Hamilton Masakadza notwithstanding. Playing his 289th match, he overtook Grant Flower as the most experienced Zimbabwean international. His experience would have been vital for a young Zimbabwe side if they were to post a more respectable total. But once he holed out to midwicket, this slipped into a no-contest zone. 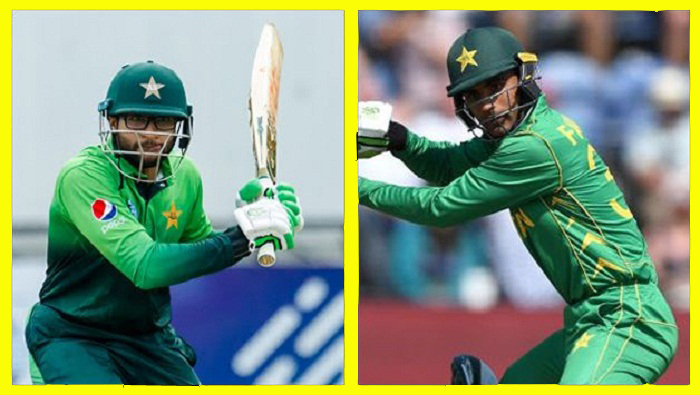 The noteworthy performances came from Fakhar and Imam, who brought up their third hundred partnership in four games. Once again, there never seemed to be any hint of a wicket-taking threat in the hosts' line-up. Even Blessing Muzarabani, far and away Zimbabwe's best bowler in the last two series, was strangely erratic. Fakhar brought up his third ODI hundred in the 31st over, carving Wellington Masakadza away between cover and point to the boundary. Two balls later, he muscled the bowler over wide long-on for six, serving everyone notice he was about to properly cut loose. And cut loose he did. At some point, it becomes churlish to harp on about the lamentable performance from the hosts, so if you wanted uplifting, you needed ignore what went on at the bowler's end and simply watch Fakhar playing like a child on his favourite ride in Disneyland. Without a care in the world, the left-hander batted like it was the day he had given up on everything else to become a cricketer. It could not get easier, or more fun. After he had raced to 150, he was standing well outside off, exposing all three stumps, to open up that midwicket area he will probably cherish more than his first-born. Nothing the bowlers did provided him any semblance of a challenge, and as he bolted along, it became obvious Saeed Anwar's 24-year record - the highest score for a Pakistan batsman in ODIs was under serious threat. A hoick to midwicket (where else?) for four knocked Anwar off that perch, to be replaced by this 21st century left-handed opener. A few balls later, he had become the eight man to reach 200, getting there off just 147 balls. Meanwhile, Imam, by no means sedate but made to look so by Fakhar, brought up his third century in just his eighth ODI as Pakistan's opening partnership left record after record tumbling in their wake. The highest opening partnership in Pakistan history? Gone. The highest opening partnership for any country in ODI history? See you later. The first 300-run opening partnership? Easy peasy. Zimbabwe conceded 304 in 42 overs before they had a wicket; Imam perished while attempting yet another slog over the leg side, as Zimbabwe avoided the ignominy of becoming the first side in history to go wicketless right through an innings. But that brought the explosive Asif Ali to the crease, and he, along with Fakhar batting like a man possessed, pillaged 90 runs off the last eight overs. By this time, Asif had taken over from Fakhar, and found enough time to bludgeon 50 off 22 balls, and helping bring up Pakistan's highest ODI total. Zimbabwe tried to begin as brightly as they could, but without any belief they couln't have dared to even get near They were also up against arguably the best bowling attack in the world. Tinashe Kamunhukamwe, opening with his captain, isn't exactly a household name yet. By the time Masakadza was dismissed, Kamunhukamwe and Tarisai Musakanda had already perished. To their credit, both young batsmen were trying to be selfless, playing attacking shots instead of conservatively looking to muster up a respectable personal score. After the top order was back in the pavilion, the run rate dropped like a stone; any pretence of seeking to hunt down the target had been abandoned. Peter Moor and Ryan Murray consolidated, but there was a nihilistic feel to the contest by that point. Elton Chigumbura and Donald Tiripano cobbled together a 67-run partnership, but there was no reason for joy to be found there, so little could be read into it. There is still no indication Chigumbura can continue to be the attacking threat that made him so dangerous an option for Zimbabwe over the years, and Tiripano bats far too high at No. 7 despite top-scoring with 44. The only reason for uplift from a Zimbabwean perspective was listening to the deep passion for the game in the voices of the tiny crowd who bellowed the hymn-like Zimbabwean anthem proudly from the bleachers. They have seen this before, and become almost inoculated against their side as it perilously lurches from crisis to crisis. They will be back. Whether Zimbabwean cricket can reward them with performances their loyalty and passion deserves is a very different question, with no comforting answers in sight.